With the ability to video chat with up to 10 people or accounts, Hangout (technically “Hangouts,” but most folks seem to drop the s) is a great option for personal live chats with key stakeholders. Skype, which has offered video chat for longer, limits you to two participants for a free account. Google has a great tutorial on how to use Hangout. Here are six ideas of how you can put Hangout to work for your nonprofit, business, cause or organization. 1Volunteer meet-ups: Connect volunteer groups in multiple locations with monthly Hangouts that allow your volunteers to share success stories, celebrate victories and host special learning sessions to do better work in the field. 2Donor thank yous: Invite groups of donors at all levels to a hang out with board members, program leads or constituents and recipients of your services so they can ask questions, see how their donations are being used and experience how thankful you are for their support. 3Celebrity & influencer Meet + Greet: Want to maximize your celebrity or influencer contacts? Have them offer up 30 to 60 minutes of their time for a virtual meet and greet with key donors or volunteers. This can be a private concert, a Q&A or even a reading of their next project. This exclusive content brings your celebrity spokespeople and donors closer to those funding your work. 4Online interviews: Become a thought leader and beef up your content strategy by conducting online interviews with noteworthy officials or interesting people who are helping to move the needle for your cause. Record it and add it to your YouTube channel. 5One world, one office: Have multiple offices or staffers scattered across the globe? (I’m looking at you, international NGOs.) Hangout makes it easy to have daily, weekly or monthly check-ins to ensure you are up to date with what’s happening in the field and sharing and reapplying what’s working in donor services. By using Hangout rather than a call, you can actually see what is happening from office to office. It’s a far richer experience. 6Meet your community: If your supporters are too dispersed to meet at a Meet-Up or TweetUp, how about face to face using Hangout? Generate goodwill by creating, say, a Hangout at lunchtime on the first Tuesday of the month and invite the public to pop in and discuss your cause, your organization or whatever’s on their mind. Spread the word about your Hangout using Hype My Hangout. 7Online learning & training: If your nonprofit or organization has an educational component, or if you bring in guest speakers who would be comfortable interacting in a webcast format, Hangout is a great way to capture the session for later playback. In May, Google introduced Hangouts On Air. By checking “Enable Hangouts On Air,” you can broadcast your live hangout — from the Google+ stream, your YouTube channel or your website — to the entire world. Afterward Google will upload a public recording to your YouTube channel and to your original Google+ post. A number of nonprofits and social good organizations are already using Google Hangout on a regular basis. • Ghetto Film School, a nonprofit that teaches the art of cinematic storytelling to young filmmakers from the South Bronx and beyond, has been using Google Hangout for its online MasterClass series that connects great directors with aspiring filmmakers from around the world. See the MasterClass 9 video immediately above for a 77-minute class using Google Plus. • Socialbrite, the blog you’re reading, has its strategists get together on Google Hangout once a month to discuss nonprofit clients and plans for the website, and from time to time for other discussions — like last night (see photo at top). The partners are rarely in the same place and work out of offices in San Francisco, Boston, Chicago and London. 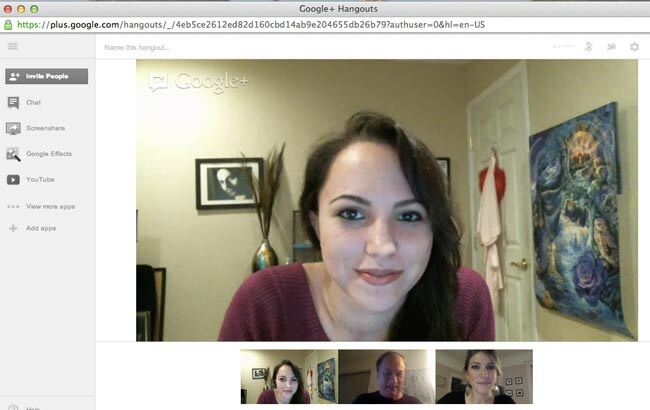 These are just a few ideas on the many ways Google Hangout can benefit your organization. We’d love to hear your thoughts and ideas on how to put this great tool to work for your cause! Please add a comment below. Renee Alexander lives in Brooklyn and has worked in the nonprofit and social good sectors for much of the past decade and has directed social media programs and campaigns for UNICEF and Operation Smile. Follow her on Twitter at @luckyrenee. She also ♡s Socialbrite. I’ve been using Google Hangout over Skype for video conferences simply because you’re limited to two people on Skype for video chatting. How about other folks? Your article is great and I appreciate you.Jasico is very good at rendering quality customer support service. I would like to use Google Hangouts for organizational meetings and open-to-the-public panel discussions, but I’m reluctant for two reasons: 1. As far as I can tell, viewers must create a Google account to watch the hangout. This is a barrier for many. 2. I want to be able to collect emails from those who attend (who aren’t already on our list) without having a two-stage registration. How do others deal with these problems?